One life. Pure and simple. A participant's handbook for the Christianity Explored Universal course. The Christianity Explored Universal Handbook contains everything a guest needs to take part in the eight-session course. 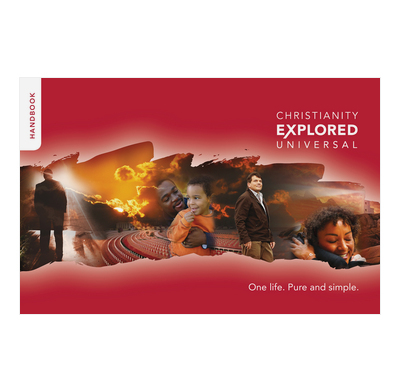 The Universal edition of Christianity Explored is designed to be universally accessible with a special emphasis on clear and simple English. Written in a Bible study format, participants discover the life of Jesus together as they work through eight sessions in Mark’s Gospel. Use of the CE DVD is entirely optional. It is ideal for International students or anyone who would benefit from a Bible study format and straight-forward, everyday English. 3. Why did Jesus come? 5. Why did Jesus rise from the dead? 6. How can God accept us? 9" x 5.9" x 0.1"
It's nice to have a small and inexpensive study guide we can use with students in a bilingual Bible study (English and Japanese). The introduction page and the map are helpful for newcomers. The side notes and "Bible Words" are helpful too, although some of the definitions use somewhat difficult words to explain other difficult words. We use a bilingual Bible when we read the scripture passages, and we also watch the Christianity Explored presentations on DVD. This seems to be working well. Since the DVD presentations move very quickly, it's a bit hard for some of the students to take it all in while they are watching and reading subtitles at the same time. Having the universal handbook helps them focus on main points (although the content of the Handbook does not always follow the sequence in the DVD presentation exactly). The members of our group have a fairly high level of English proficiency--in reading especially. For students who are not so comfortable reading English, this text would probably be difficult. We are using the handbooks in a weekly homegroup made with international students in France. The Universal version is very useful for sharing the gospel with clear words and with people not fluent in English. Thank you for this support! We haven't used it so far although we are running a C.E course using the previous material. ;- one of our leaders thought the print size & paleness of the type might make it difficult for some with reading disabilities and the were still a lot of words per page. We think maybe it would be a good tool to use as a standalone Bible study and liked its simplicity. We are now running our 3rd course (6 monthly intervals) and have seen the Lord save lives through each course.